Several years and a few lifetimes ago when I was working in the Austin Public Library's Interlibrary Loan Department, we had one of many pot-luck parties down in the basement offices of the Central Texas Library System, of which we were a part. In case you didn't know, librarians make pretty good cooks, and we always ate well and I usually learned something new every time. That's when I learned how to make quiche, as a matter of fact. Every year, each department would host a Christmas party for the rest of the library throughout December (was it every week? every day? Gosh, that was a lot of parties!). Imagine my dismay when I realized that my new department hosted the quiche party. Huh? It was the 1970s - I didn't know nothing about making no quiches. But I found a recipe, bought some frozen pie shells, and danged if I didn't knock out some tasty pies. So tasty, in fact, that for the next several years not only did I bake a few quiches for the library party, it was my job to make quiche every year for the family Christmas Eve dinner. But I digress. Back to our potluck party down in the basement of the old library building where our parent department lived. I don't remember what I made for this particular party. All I remember is the corn casserole one of my co-workers brought. 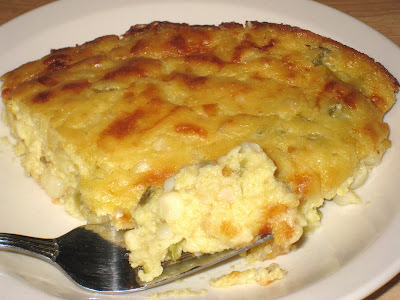 It was moist and cheesy and had a slight tanginess that I could not for the life of me place. It didn't look like much, but it was so full of corny goodness and that odd almost-spicy-but-not-hot zing and I could not stop eating it. I was thrilled that she was willing to share the recipe with me. There were two ingredients that made this dish stand out, especially for those times. The source of that slightly tangy flavor was yogurt, of all things. Keep in mind that most people would not go near yogurt with a ten-foot pole in those days, so it was quite exotic that it was a major component of this dish. I have to say that it was using plain yogurt in this casserole that helped me develop a taste for it, and I began to use it on a more regular basis in my kitchen. And it complemented the corn beautifully without overpowering it, and added extra creaminess to the mix without the fat of heavy cream. The second ingredient was chopped green chilies. I had never heard of them. And I've just now realized that I have no idea what kind of chilies they are. They come whole or chopped in a 4-ounce can and you can find them at any grocery store in the Latin American food section. They are mild but have a rich, slightly pickled, slightly smoky flavor that complements the tang of the yogurt, the sweetness of the corn, and the richness of the cheese. Oh yeah, there's cheese in there too. The recipe lends itself to some improvisation. Here, I sauteed some sliced carrot and added it to the mix before baking. Chopped green peppers magnify the flavor of the chilies. Onion is always welcome to the party. The only thing my co-worker warned me about when she mentioned adding other vegetables was to do so sparingly or the dish could become too dry. I did not believe her, but one night when I was feeling particularly ambitious and added all of those extra items I discovered that she was right. It still tasted good, but it was not nearly as rich and creamy as usual, and that is what makes it so good. When I first started making this, I used a commercial brand of corn meal with the hull and most of the germ of the kernel removed. While this gives the corn meal a longer shelf life, it also removes most of the fiber and protein. I didn't even know there was a difference in those days. Now, I buy stone ground corn meal (usually Bob's Red Mill polenta). As good as it was before, the stone ground corn meal lifts it to another level. It adds a grits-style body to the texture of the casserole, and wraps all of the other ingredients in the luscious sweetness of the corn. This is super easy to make, and always impresses. It's extra delicious served with fresh salsa. 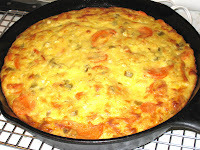 Pour into buttered casserole dish (a cast-iron skillet works very well). Bake at 350 deg. F. for about 40 minutes, until the top is browned. Let cool a little before serving.